We are Liquidating Collector Vintage Marvel and DC, Comic Books. Spider-man,Iron man, Batman, Superman, Fantastic Four, Wonder Woman, the new teen titans, power man, iron fist, super boy, and more. Sales Tax : 8.1% - Sales tax applied to invoice total, including Internet Premium. Payment Instructions: Online Bidders are welcome to call us at 702-981-9185 to pay by credit card. We accept Cash, Visa, MasterCard, Discover, AMEX, Paypal, Money Orders. Card Charge will appear on your credit card statement as "Cash for Collectibles". Local bidders may Pick up Items Locally to save on Shipping. Pick up: Monday Tru Friday 9AM-4PM. No Items will be released or sent until full payment is made. Preview Date & Times: Item viewing may be done through the pictures listed on Proxibid. Local viewing will be permitted only by established customers. Checkout Date & Times: All Items Must be paid for in full within 3 Days following the Auction. No items may be removed or shipped until paid for in full (including any shipping costs). All auction items must be Paid for within 2-3 days after the Close of the Auction! Attention New Bidders and Bidders - We do NOT Have Your Credit Card on File unless you personally called us with it. After an Auction Closes please send your payments through Paypal to Our Account at Fraze1214@yahoo.com. Or Call us to Put Your Credit Card on File with us. Card Charge will appear on your credit card statement as "Cash for Collectibles". Please Pay for items and Pay for Shipping within 3 day of the close of the auction. We are not a warehouse that can store your items for weeks after the close of an Auction. All sold items must be removed or shipped out of our location within the 3 days following the close of an auction. We are Not responsible for any Lost, Damaged, or Missing Items that were not paid for within the 5 days following the auction. However, the bidder is still responsible to Pay for all items that the bidder bids on in each Auction. It is NOT Acceptable to Refuse to Pay for an Auction in order to renegotiate your invoice. It is NOT Acceptable to refuse to pay for auctions until you get a combined shipping invoice. We will NOT Combine Shipping for separate Auctions. All Auctions are individual transactions and are to be treated as such. We ship as a courtesy to our customers for their convenience. Since each Auction is an individual transaction they must be paid for and shipped individually. Items can be picked up locally at our current location at 2010 East Pebble Rd., Las Vegas NV, 89123. We will pack and ship all items that can not be picked up locally at cost through the US Post Office. No items may be removed or shipped until paid for in full (including any shipping costs). Any Items Not Paid for within 7 days from the Close of the Auction Shall be Forfeited by the Buyer and will no longer be considered their property. However, the bidder will still be responsible for the hammer price of the items that were bid on plus the buyers premium. AGAIN: We are Not responsible for any Lost, Damaged, or Missing Items that were not paid for within the 3 days following the auction. Once the 5 day deadline for payment has come and gone auction items are subject to be, re-sold, donated, or thrown away. Bidder will then be blocked from all future auctions for interfering with the Auction Sale. Bidder can be unblocked only when they have paid the hammer price and the buyers premium that they agreed to pay in order to register for the auction. However, even if a bidder pays the hammer price and buyers premium on a "forfeit item" nothing will be shipped to that bidder and they will not be able to pick up the forfeit items. Forfeit Items are No Longer Buyers Property. Blocked or Black Flagged Bidders may have their Block or Flag removed only after They Pay the Buyer's Premium for all the items that they bid on and won Plus a 10% Re-Stocking Fee. Minimum Fee on small invoices ($100.00 or less) to Release a Block or a Black Flag will be the entire cost of the bidders invoice or $20.00 (which ever is less). We will Gladly Package and Ship Items for On Line Bidders. We Ship through the USPS Mail. We try to get the lowest shipping quote and charge Only the Shipping at our cost (which also include insurance, boxes and packing material). All Items will be Shipped at Lowest Cost except in the case of High End Comic Books and Collectibles. Average Shipping for a 14 x 14 x 14 box at 15lbs will cost around $25.00 or less to anywhere in the continental US. Bidders are encouraged to Buy in Bulk as shipping one item will cost about the same to Ship 20 items. In the case of High End Collectibles vrs Non- Collectible Items: There is a fine line between protecting High End Expensive Collectibles in shipping and Shipping items for the least amount of Money. Every Time we ship items we have to make decisions on Shipping cost vrs Protection. When items are Sold at higher prices we tend to ship with a lot of extra protection, in more boxes, with added insurance, ect... This is to protect expensive items from damage in shipping. However, this extra protection does come with higher shipping costs. When items are Sold at a very low price we do not consider them collectibles and we will ship at the lowest costs possible. Example: We do not consider a sale of 20 comic books at 25cent each a "Collectible" purchase. As such we will pack and ship at lowest costs possible to save you money. However, If you as the buyer Do consider lower price items as collectibles it is up to you as the buyer to contact us to make arrangements to update your invoice and pay the extra cost involved in shipping your items. Damaged Items Claim: In the event that any items are damage in shipping we must start and insurance claim. In order to start an insurance claim you as the buyer and the one who accepted the damaged items must submit to us in writing the following info: Bidders Name, Address, Auction Paddle Number, Lot numbers of the items that were damaged, and the specific description of the damages. We will also need photos of the damage. Once we obtain ALL this information we will begin the damage claim. Claims can take anywhere from 2-4 weeks to investigate. You may be require to send the items back or we may allow you to keep the items. We make this decision based on a case by case basis. All claims will be paid out as Auction Credits – No Refunds are Given Email Claims to LVLAuctions@gmail.com All Claims for damage Must be Filed with 3 days of receipt of auction items. Buyer should know right away if items are damaged in shipping and so should inform Las Vegas Liquidations Shipping Department at the Email address provided as soon as possible. If a claim is not filed within 3 days of receipt of your auction items we will assume that you have received all your auction items in Satisfactory Condition. All Items are to be Sold As Is, Where is. We will describe the items as best we can. However, it is the responsibility of the Buyer to Inspect any items that they intend to bid on. We will be available for questions in person or over the phone. But, we encourage all bidders to take the time to inspect items in person so that you will know exactly what you are bidding on. We in no way make any special guarantees or warranties on any items. We will take responsibility for any items that are clearly described wrong. However, we make absolutely No Promises on any item that is not listed in the description. Shipping Customer Service - 702-981-9185 Please contact our shipping department for shipping questions at LVLAuctions@gmail.com Buyers Please do not Waste your time with $1 purchases. When you bid the absolute minimum bid on one item and win that item at $1 remember - we still have to ship your item to you at a cost that will most likely far exceed the purchase price. Please do Not Buy 1 large item for $1 and expect us to cover part of your shipping costs because shipping came out higher than the cost of the item. Shipping cost have NOTHING to do with how low your invoice is on the items. Shipping cost are Fixed and we can not do anything to change that. If a Bidder does not want to pay for shipping - That is Fine with us. However, bidder is still responsible to pay the full hammer price and buyers premiums that they agreed to pay when they registered for the auction. Bidder may pay their invoice minus the shipping costs. However, if this is the case and No Shipping is Paid - NOTHING will be shipped. This is a good tactic for the professional bidder because it will keep your account with us and Proxibid in good standing and will allow you to continue to participate in future Auctions. We Will Block Bidders from all Future Auctions for un-paid invoices even if the invoice is Only $1 because we do not appreciate bidders that interfere with our Auction Sales. Insurance will be added to packages at a rate of $1.50 per $50 Value of Item rounded up to nearest $50.00. Insurance will Only Cover the Cost of the Item(s). Insurance will NOT Cover Our Shipping Costs or the Buyers Premiums. High End Comic Books will be Shipped in an Over-sized Priority Box with Lots of Padding and Protection with Insurance. This is to insure from any damage of Un-replaceable collectible items. Shipping Customer Service - 702-981-9185 Please contact our shipping department for shipping questions at LVLAuctions@gmail.com Note on Large Artwork: We will Not Ship Large Art or Framed Memorabilia. It is the Buyers responsibility to arrange their own packing and shipping. Items that can not be shipped will be noted as such in the item description. All Items are to be Sold As Is. We will describe the items as best we can. However, it is the responsibility of the Buyer to Inspect any items that they intend to bid on. We will be available for questions over the phone. We in no way make any special guarantees or warranties on any items. We will take responsibility for any items that are clearly described wrong. However, we make absolutely No Promises on any item that is not listed in the description. Because many items in Our Auctions Sell for FAR Below their Fair Market Value, we reserve the right to bid on our Consigners items ourself personally. PLEASE READ: At the request of the auction company, this auction permits bids to be placed by the auctioneer, an employee of the auctioneer, or the seller or an agent on the sellers behalf, even if such bids are placed solely for the purpose of increasing the bid. While Proxibids Unified User Agreement prohibits this behavior, in accordance with UCC 2-328, this auction is permitted to engage in this activity by providing this clear disclosure to you, the bidder. Las Vegas Liquidations does not add a Handling fee to package and ship items to our customers. We charge only our actual costs to ship. Most items are shipped out within 24 to 36 hours from the time of payment. We always try to ship items as quickly as possible. However, in order to keep shipping cost low we ask our customers to be patient with shipping time. Once Items are shipped bidder will be sent a tracking number to their email address on file with Proxibid. In the event that a bidder requires items to be shipped immediately following payment we would then require a phone call from the bidder requesting immediate shipping to 702-981-9185. In this event bidder would also have to agree to a $60.00 special immediate care handling fee that would be added to the shipping cost. On Autographed Memorabilia - We are qualified at Authentications. When we list and sell items we describe and list items to the very best of our skill and knowledge. However, we in no way guarantee that other authentication companies will confirm our authentications. On Comic Book Auction We may give Uncertified Grades to Help Bidders Know the Condition of each Comic Book. The Grades are based on Our Best Knowledge and Experience on Grading. We in No Way Guarantee that CGC or any other grader will give the exact grading number that we offer. We take close-up pictures of each comic book and suggest you zoom into the photo of the comic you are interested in to see the fine details. If you have any questions regarding the detail condition of any comic books we welcome you to call us and we can describe in detail over the phone any comic book's condition. Call Frank at 702-981-9185. If you are in Doubt about any items Condition, Grade, Authentication or Anything Else... Please do Not Bid on the items. All items are Sold as is. No Refunds or Exchange. Any problems with orders such as damages on items in shipping will settled as a credit on your next or on a future action invoice. In the Rare Case When a Customer DEMANDS to Return items for what ever reason for a refund. It should be known that We will NOT Refund Shipping. We will NOT Refund Buyers Premium. We will Only Refund 90% of the Hammer Price of the items and Keep 10% of the hammer for a re-stocking and Re-selling fee. If the Buyer will agree to these rules we may refund Only if the items are returned in the Exact Same condition and they were when they left our store. We Do not Tolerate Fraud or Theft: We will file a federal police report on Any Customers attempting to acquire auction items without paying for them. We have had a couple of customers in the past year that have purchased very expensive items then have returned to us completely different items or in some cases returned a box of trash just to show Paypal or their credit card company a return tracking number. We have a photo record of items before they are shipped and we take a photo record of returned items. Any customer attempting to return items that are NOT the items that were shipped to them will be reported to the police and we will pursue federal criminal charges against such action. Las Vegas Liquidation holds the right to change and update the rules of our auctions and needed. Auctions are a great way for buyers to get great items at great prices. Auctions are also pretty fun to participate in. Las Vegas Liquidations wants our bidders to have fun with their auctions. We want you to get great deals. We want you to enjoy the entire auction process and we want you to enjoy your won items. These rules are simply set up to protect all parties from misunderstandings and abuse of the system. If there are any questions about any points made here feel free to call us at 702-981-9185. Thank you for participating in our auction! Please be sure to view all pictures for further information on all items listed before placing bids.We are Liquidating Collect...moreor Vintage Marvel and DC, Comic Books. Spider-man,Iron man, Batman, Superman, Fantastic Four, Wonder Woman, the new teen titans, power man, iron fist, super boy, and more. . ALL ITEMS SOLD AS PICTURED. . ALL SALES FINAL NO RETURN OR EXCHANGE AND SPECIALLY NO REFUND! You've been outbid to K****1! to YOU! Lot of 6 Pcs Collector Vintage Marvel Comics Captain America No.358.359.360.362.363.367. You've been outbid to s****7! to YOU! Lot of 9 Collector Vintage Marvel Comics Captain America No.368.369.370.371.372.373.2.7. You've been outbid to F****9! to YOU! Lot of 6 Pcs Collector Vintage Marvel Comics Captain America No.295.298.346.347.356.357. Lot of 6 Collector Vintage Marvel Comics The Invincible Iron Man No.121.122.123.125.126.127. Lot of 6 Collector Vintage Marvel Comics The Invincible Iron Man No.129.130.131.132.133.135. Lot of 6 Collector Vintage Marvel Comics The Invincible Iron Man No.136.137.138.139.140.141. Lot of 6 Collector Vintage Marvel Comics The Invincible Iron Man No.142.143.144.145.146.147. Lot of 6 Collector Vintage Marvel Comics The Invincible Iron Man No.148.149.150.151.152.153. Lot of 6 Collector Vintage Marvel Comics The Invincible Iron Man No.154.155.173.175.176.177. Lot of 6 Collector Vintage Marvel Comics The Invincible Iron Man No.178.179.180.181.182.185. Lot of 6 Collector Vintage Marvel Comics The Invincible Iron Man No.191.192.234.235.244.245. Lot of 5 Collector Vintage Marvel Comics The Invincible Iron Man No.246.247.248.249.252. Lot of 5 Collector Vintage Marvel Comics The Invincible Iron Man No.253.254.255.256.257. Lot of 6 Pcs Collector Vintage Marvel Comics Captain America No.249.252.253.254.255.256. Lot of 6 Pcs Collector Vintage Marvel Comics Captain America No.263.264.265.266.285.288. Lot of 6 Pcs Collector Vintage Marvel Comics Captain America No.289.290.291.292.293.294. Lot of 6 Collector Vintage Comics Daredevil The Mna Without Fear No.148.161.162.164.165.166. Lot of 6 Collector Vintage Comics Daredevil The Mna Without Fear No.178.179.180.193.195.196. You've been outbid to E****O! to YOU! Lot of 6 Collector Vintage Comics Daredevil The Mna Without Fear No.199.214.249.250.251.252. 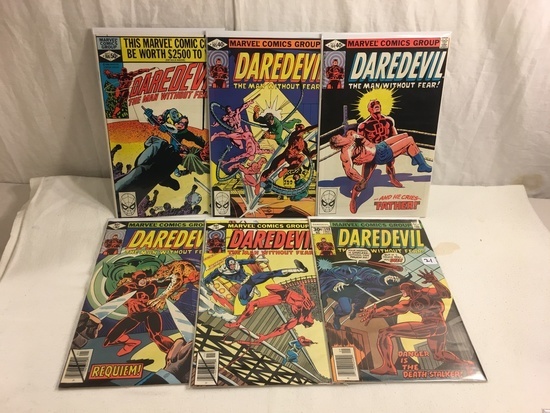 Lot of 6 Collector Vintage Comics Daredevil The Mna Without Fear No.253.254.255.256.258.260.